Top-seeded Aidan Mayo of Roseville in the Sacramento area wore down ninth-seeded Vikas Deo of Carrollton, Texas, 7-5, 6-1 today to reach the boys 12 semifinals at the USTA National Winter Championships in Tucson, Ariz.
Mayo, who trains at the USTA center in Carson, will meet fourth-seeded Niroop Vallabhaneni of Paradise Valley, Ariz. Vallabhaneni routed sixth-seeded Sam Feldman of Brookline, Mass., 6-0, 6-2. Mayo's doubles semifinal was postponed by rain. Top-seeded Mayo and Billy Suarez of Huntington, N.Y., are scheduled to play fourth-seeded Hugo Hashimoto of San Jose and Alex Lin of Granite Bay. In the girls 14s quarterfinals, sixth-seeded Katie Volynets of Walnut Creek lost to ninth-seeded Chelsea Kung of Fort Worth, Texas, 2-6, 6-3, 6-1. Volynets won the USTA Girls 12 National Championships in Alpharetta, Ga., in August, and Mayo took the boys 12 consolation title in last week's Junior Orange Bowl in Coral Gables, Fla. In Scottsdale, Ariz., the boys 16 quarterfinal between 17th-seeded Austen Huang of Elk Grove and fourth-seeded Timothy Sah of San Diego was postponed by rain. It will be remembered as the year of youth in Northern California. Everywhere you looked -- in the professional, college and junior ranks -- teenagers either from NorCal or playing in the region starred in 2014. 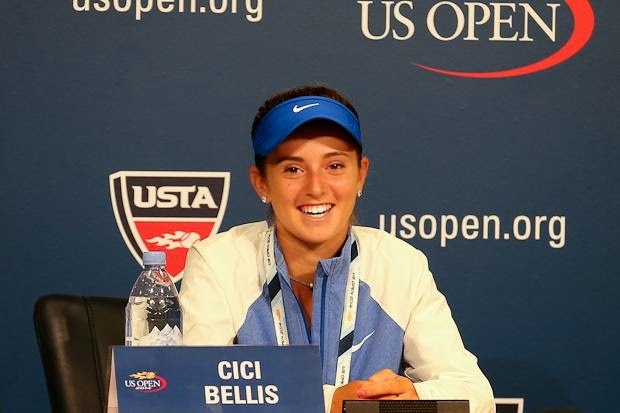 And no one shone brighter than 15-year-old CiCi Bellis of Atherton. Bellis became an overnight sensation in the U.S. Open, overshadowing the rest of her phenomenal year. Naomi Osaka, 16, of Japan pulled off a major upset in the Bank of the West Classic on the elite WTA tour at Stanford. Stefan Kozlov, Jared Donaldson and Michaela Gordon broke through in NorCal Challengers. Kozlov, 16, and Donaldson, who turned 18 on Oct. 9, are pros from Florida and Rhode Island, respectively. Gordon is a 15-year-old amateur from Saratoga, near San Jose. Unseeded Lynn Chi reached the NCAA women's singles final in May as a 19-year-old Cal sophomore. Sacramento's Collin Altamirano gained the final of the USTA Boys 18 National Championships for the second straight year. Sam Riffice, 15, of Roseville achieved a rare double. His neighbor, 14-year-old Keenan Mayo, and Katie Volynets, 12, of Walnut Creek won USTA national titles. Marring an otherwise glorious year were the depravity of Deepal Wannakuwatte, the demise of the Sacramento Capitals in World TeamTennis and the loss of the legends tournament in Sacramento. 1. Bellis stuns Cibulkova in U.S. Open -- Bellis shocked 12th-seeded Dominika Cibulkova of Slovakia 6-1, 4-6, 6-4 in the first round at Flushing Meadows. Bellis, then the second-ranked junior in the world, overcame a 3-1 deficit in the third set to become the youngest player to win a main-draw match in the U.S. Open since Anna Kournikova, also 15, in 1996. Cibulkova, only 5-foot-3 (1.61 meters), was the runner-up to Li Na in the Australian Open in January and won last year's Bank of the West Classic at Stanford. Bellis' hometown of Atherton is adjacent to Stanford, and she grew up attending the tournament. players warm up before a World TeamTennis match in 2013. 2. Bryans win U.S. Open for 100th career title -- Appropriately, top-seeded Bob and Mike Bryan outclassed 11th-seeded Marcel Granollers and Marc Lopez of Spain 6-3, 6-4 at Flushing Meadows for their 100th men's doubles title. The Bryans, 36-year-old identical twins and ex-Stanford stars from Southern California, extended their record to 16 Grand Slam men's doubles crowns. Five have come in the U.S. Open, tying Richard Sears and James Dwight in the 1880s. The Bryans surpassed Bob Lutz and Stan Smith for the record in the Open era, which began in 1968. 3. Wannakuwatte sentenced -- Wannakuwatte, the Capitals' owner, was sentenced in November to 20 years in prison for orchestrating a massive Ponzi scheme. Wannakuwatte, a 64-year-old native of Sri Lanka, will be eligible for parole in 17 years. Wannakuwatte was arrested on Feb. 20 in Sacramento on charges of defrauding banks and individual investors in his medical supply business of more than $100 million. 4. Bellis ends year as world's top junior -- Bellis clinched the year-end No. 1 ranking by reaching the quarterfinals of the prestigious Orange Bowl in Plantation, Fla., this month after previously top-ranked Shilin Xu of China lost in the first round. The second-seeded Bellis fell to 13th seed and eventual champion Sofia Kenin, 16, of Pembroke Pines, Fla., in the Orange Bowl semifinals. Bellis, however, won the doubles title with Marketa Vondrousova of the Czech Republic. 5. Bellis wins USTA 18 title -- Bellis, seeded second, drubbed fifth-seeded Tornado Alicia Black, 16, of Boca Raton, Fla., 6-3, 6-1 in San Diego to become the youngest winner of the USTA Girls 18 National Championships since Lindsay Davenport, also 15, in 1991. Bellis, who won 12 of the last 13 games after trailing 3-0 in the first set, earned an automatic wild card in the women's main draw of the U.S. Open. serve in the Bank of the West Classic at Stanford. Photo courtesy of Bank of the West Classic. 6. Lisicki blasts world's fastest women's serve -- Sabine Lisicki of Germany unleashed a 131-mph (210.8-kph) rocket in a 7-6 (2), 6-1 loss to fifth-seeded Ana Ivanovic in a first-round day match in the Bank of the West Classic. Venus Williams, who held the previous mark of 129 mph (207.6 kph), overpowered qualifier Paula Kania of Poland 6-3, 6-2 in the featured night match at Stanford. 7. Serena wins BOW again -- Top-seeded Serena Williams captured her third Bank of the West title, beating third-seeded Angelique Kerber of Germany 7-6 (1), 6-3. 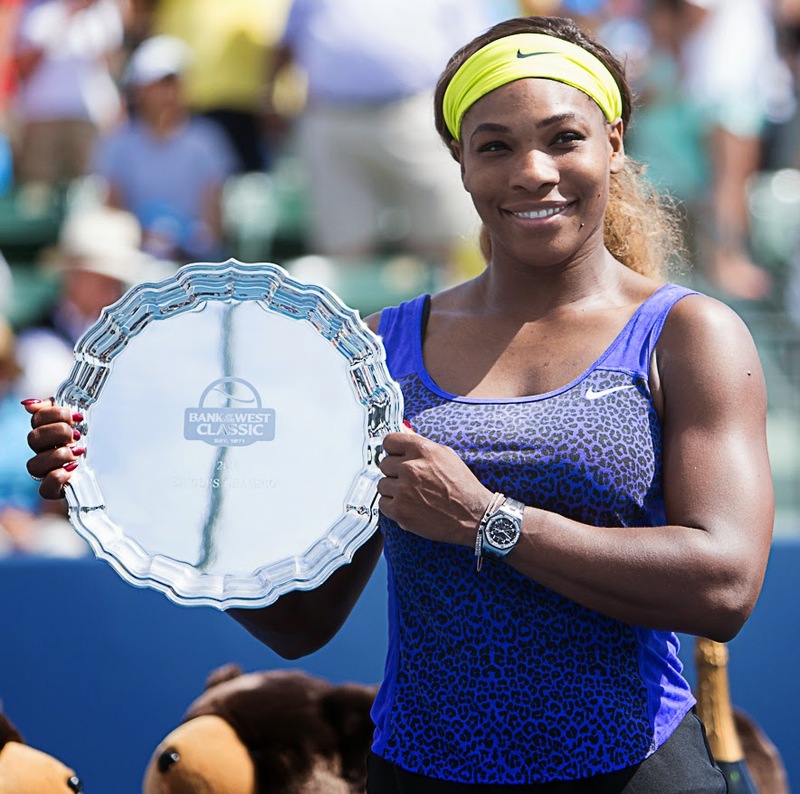 Williams, who overcame a 5-1 deficit in the first set and two set points at 5-2, also won the tournament in 2011 and 2012. She did not return last year. 8. Kozlov reaches Challenger final -- Kozlov, a wild card, stunned No. 2 seed Tim Smyczek of Tampa, Fla., 3-6, 6-3, 7-6 (1) in the semifinals of the $100,000 Sacramento Pro Circuit Challenger at the Natomas Racquet Club. Kozlov recorded his first victory over a top-100 player -- Smyczek (pronounced SMEE-check) was No. 99 -- and reached his first Challenger final in only his third attempt. Top-seeded Sam Querrey ended Kozlov's amazing run in the final, 6-3, 6-4, but predicted his young countryman eventually would crack the top 10 in the world. 9. Riffice wins back-to-back major junior titles -- Riffice joined Grigor Dimitrov as the only players to sweep the boys 16 singles titles in the Eddie Herr International Championships and the Orange Bowl. The tournaments were held back-to-back this month in Bradenton, Fla., and Plantation, Fla., respectively. Dimitrov, a 23-year-old Bulgarian and the boyfriend of Maria Sharapova, is ranked 11th in the world after ascending to a career-high No. 8 in August. 10. Capitals move after 28 years, then fold -- The Capitals, the longest-running and most successful WTT franchise, announced in February that they were moving to Las Vegas. However, the team disbanded five weeks later after Wannakuwatte was charged. The Capitals won a record six WTT titles during their 28 years in Sacramento. Kolleen McNamee, the team's general manager, cited the lack of a permanent tennis facility as the reason for the move. Honorable mention -- Davenport, a former Capital, was inducted in the International Tennis Hall of Fame. -- Northern California was omitted from the 2015 PowerShares Series schedule after a stop in Sacramento last February. Recently retired James Blake won the four-man Champions Shootout over Hall of Famers John McEnroe, Pete Sampras and Jim Courier. -- Raquel Kops-Jones, a San Jose resident and former NCAA doubles champion from Cal, reached the doubles semifinals in the Australian Open with regular partner Abigail Spears of San Diego. -- Osaka, a qualifier playing in her first WTA main-draw match, shocked unseeded Samantha Stosur, the 2011 U.S. Open champion, 4-6, 7-6 (7), 7-5 in the first round of the Bank of the West Classic. Stosur held a match point at 7-6 in the tiebreaker and led 5-3 in the third set. -- Maria Sanchez, who was born and raised in Modesto, won her first WTA title. Unseeded Sharon Fichman of Canada and Sanchez edged third-seeded Lucie Hradecka of the Czech Republic and Michaella Krajicek of the Netherlands 2-6, 6-0 [10-4] in the doubles final of the $250,000 ASB Classic in Auckland, New Zealand. -- Querrey swept the singles titles of the Napa, Sacramento and Tiburon Challengers in consecutive weeks in late September and early October. -- Bellis won back-to-back $25,000 Challenger singles crowns in Rock Hill, S.D., and Florence, S.C., reached the girls doubles final in the French Open (with Vondrousova), helped the United States win the Junior Fed Cup in San Luis Potosi, Mexico, and captured the girls 18 singles title in the prestigious Easter Bowl in Indian Wells. -- Donaldson reached the semifinals of the $50,000 Napa Challenger and quarterfinals of the Sacramento Challenger at 17. -- Gordon advanced to the quarterfinals of the $25,000 Redding Challenger before losing to Alexandra Stevenson, a 1999 Wimbledon semifinalist and the daughter of basketball legend Julius Erving, in a third-set tiebreaker. -- Chi fell to Danielle Collins of Virginia 6-2, 7-5 in a matchup of unseeded sophomores in the NCAA women's singles final in Athens, Ga.
-- Paul Goldstein, a Stanford alumnus and former pro who climbed to No. 58 in the world in singles and No. 40 in doubles, was named the Cardinal's third men's coach since 1967. Goldstein, who turned 38 in August, replaced John Whitlinger, who announced his retirement at age 60 after Stanford's second consecutive first-round exit from the NCAA Tournament. The Cardinal has won 17 NCAA men's team titles, second to USC's 21, but none since 2000. -- The injury-plagued Sacramento State women suffered their first Big Sky Conference losses in 13 years. -- Jessica Willett, a junior at San Jose State, saved 11 match points in a 6-2, 0-6, 7-5 victory over Suzy Tan at No. 5 singles to clinch the Spartans' 4-2 victory over Dartmouth in San Jose. -- Altamirano, the fifth seed and defending champion, lost to third-seeded Noah Rubin of Rockville Centre, N.Y., 6-4, 6-4, 6-3 in the final of the USTA Boys 18 National Championships in Kalamazoo, Mich. Rubin had won the Wimbledon boys singles title the previous month. -- Riffice, Mayo and Milpitas' Andrew Ton won boys titles in the USTA National Clay Court Championships. Riffice captured the 16 doubles in Delray Beach, Fla., Mayo the 14 singles in Fort Lauderdale, Fla., and Ton the 14 doubles in Fort Lauderdale. -- The top-seeded Volynets won the USTA Girls 12 National Championships, dominating sixth-seeded Sedona Gallagher of Henderson, Nev., 6-0, 6-3 in Alpharetta, Ga.
1. Altamirano to attend Virginia -- maybe (1,863 hits, May 8). 2. Rankings mover of the week -- Maria Sanchez (1,071 hits, Feb. 19). 3. Querrey wins title but predicts top 10 for Kozlov (919 hits, Oct. 6). 4. Sacramento junior trains with Federer in Dubai (880 hits, Jan. 23). 5. Owner of former Capitals team charged, jailed (824 hits, Feb. 23). 6. Rankings mover of the week -- Maria Sanchez (808 hits, Jan. 9). 7. Rankings mover of the week -- Bradley Klahn (636 hits, Feb. 12). 8. Neighborly advice: Keep an eye on Roseville trio (612 hits, Aug. 24). 9. Kozlov, 16, escapes again to reach Sacramento final (553 hits, Oct. 5). 10. Grueling workouts as teen pay off for 30 Indoors champ (529 hits, May 6). 1. Why tennis is better than golf (4,881 hits, April 3, 2012). 2. Little Bellis gets big results (2,313 hits, June 24, 2012). 3. Sac State coach: Azarenka wasn't kidding around (1,970 hits, March 5, 2012). 4. Altamirano to attend Virginia -- maybe (1,863 hits, May 8, 2014). 5. Zach Gilbert's background serves him well (1,349 hits, Sept. 26, 2012). 6. Modesto's Sanchez, with unusual past, wins title (1,305 hits, June 4, 2012). 7. Rankings mover of the week -- Maria Sanchez (1,071 hits, Feb. 19, 2014). 9. Querrey wins title but predicts top 10 for Kozlov (919 hits, Oct. 6, 2014). 10 (tie). Tursunov no longer thinks father committed fault (880 hits, Sept. 23, 2011). 10 (tie). Sacramento junior trains with Federer in Dubai (880 hits, Jan. 23, 2014). Coming later today: The top 10 stories, plus honorable mentions, of 2014 in Northern California tennis as chosen by the czar. Four Northern California juniors reached the singles quarterfinals in their age groups at the USTA National Winter Championships in Arizona. Advancing today were 17th-seeded Austen Huang of Elk Grove in the boys 16s, fourth-seeded Sara Choy of Palo Alto and sixth-seeded Katie Volynets of Walnut Creek in the girls 14s, and top-seeded Aidan Mayo of Roseville in the boys 12s. Volynets won the USTA Girls 12 National Championships in Alpharetta, Ga., in August, and Mayo captured the boys 12 consolation title in last week's Junior Orange Bowl in Coral Gables, Fla.
Mayo also advanced to the doubles semifinals of the Winter Nationals with Billy Suarez of Huntington, N.Y. The top-seeded pair will meet fourth-seeded Hugo Hashimoto of San Jose and Alex Lin of Granite Bay. The boys and girls 18s and 16s are being played in Scottsdale, Ariz., and the 14s and 12s in Tucson, Ariz.
Collin Altamirano, 19-year-old Sacramentan -- No. 745 in singles (-2), No. 882 in doubles (-5). Bob Bryan, 36-year-old former Stanford star -- Career-high No. 1 in doubles (no change), unranked in singles. Mike Bryan, 36-year-old former Stanford star -- Career-high No. 1 in doubles (no change), unranked in singles. Bradley Klahn, 24-year-old former Stanford star -- No. 148 in singles (no change), No. 152 in doubles (no change). Scott Lipsky, 33-year-old former Stanford star -- No. 32 in doubles (no change), unranked in singles. Mackenzie McDonald, 19-year-old Piedmont resident -- No. 642 in singles (-2), No. 587 in doubles (-1). Dennis Novikov, 21-year-old San Jose resident -- Career-high No. 291 in singles (no change), No. 425 in doubles (-2). Sam Querrey, 27-year-old San Francisco native and former Sacramento Capital in World TeamTennis (2012-13) -- No. 35 in singles (no change), No. 64 in doubles (no change). Matt Seeberger, 30-year-old Los Altos resident -- No. 402 in doubles (-3). Dmitry Tursunov, 32-year-old resident of Folsom in Sacramento area -- No. 110 in singles (no change), No. 179 in doubles (no change). Kristie Ahn, 22-year-old former Stanford star -- No. 637 in singles (+1), No. 698 in doubles (+3). CiCi Bellis, 15-year-old resident of Atherton in San Francisco Bay Area -- Career-high No. 254 in singles (no change), career-high No. 814 in doubles (+1). Hadley Berg, 18-year-old resident of Greenbrae in San Francisco Bay Area -- No. 934 in doubles (+2). Alexandra Facey, 21-year-old resident of Cameron Park in Sacramento area -- No. 727 in doubles (+5). Kat Facey, 21-year-old resident of Cameron Park in Sacramento area -- No. 727 in doubles (+5). Nicole Gibbs, 21-year-old former Stanford star -- No. 96 in singles (no change), No. 825 in doubles (+1). Michaela Gordon, 15-year-old resident of Saratoga in San Francisco Bay Area -- No. 699 in singles (-1). Lejla Hodzic, 28-year-old former Stanford standout -- No. 733 in doubles (+5). Raquel Kops-Jones, 32-year-old San Jose resident and former Cal star -- No. 12 in doubles (no change), No. 792 in singles (+2). Maria Sanchez, 25-year-old Modesto product -- Career-high No. 79 in doubles (no change), No. 238 in singles (+2). Karina Vyrlan, 16-year-old Sacramentan -- No. 959 in singles (no change). Allie Will, 23-year-old native of San Mateo in San Francisco Bay Area -- No. 158 in doubles (no change), No. 533 in singles (+4). Carol Zhao, 19-year-old Stanford sophomore -- No. 293 in singles (+2), No. 507 in doubles (+2). No tournaments scheduled this week. Brothers Keenan and Aidan Mayo of Roseville in the Sacramento area each won consolation titles for fifth place in the recent Junior Orange Bowl in Coral Gables, Fla.
Six-foot-2 (1.88-meter) Keenan Mayo, seeded third, defeated Colombia's Nicolas Mejia, seeded fourth, 6-3, 6-4 on hardcourts in the boys 14s in the prestigious singles-only tournament. Mejia won the Eddie Herr International Championships three weeks ago in Bradenton, Fla.
Aidan Mayo, seeded ninth, beat Spencer Brachman of Commack, N.Y., by walkover in the boys 12s, played on clay. Both Mayos, who train at the USTA center in Carson in the Los Angeles area, had lost in the quarterfinals in the main draw. There were 192 players in the boys 14s draw and 128 in the boys 12s. Past winners of the Junior Orange Bowl include Juan Martin del Potro, Tommy Haas, Magnus Norman and rising Croatian star Ana Konjuh. Boys 14 -- Yshai Oliel (1), Israel, def. Chen-jui Ho, Taiwan, 7-5, 7-5. Boys 12 -- Borna Devald (1), Croatia, def. Ross Weibull (9), Sweden, 6-1, 6-0. Girls 14 -- Anastasia Potapova (2), Russia, def. Bianca Andreescu (5), Canada, 6-4, 6-3. Girls 12 -- Whitney Osuigwe, Bradenton, Fla., def. Himari Sato (1), Japan, 6-4, 6-4. Apparently, Keenan and Aidan Mayo like to stick together. Both brothers from Roseville in the Sacramento area reached the round of 16 in their respective age groups in the Junior Orange Bowl without losing a set. Then they survived three-setters to advance to the quarterfinals of the prestigious tournament in Coral Gables, Fla.
Keenan, seeded third in the boys 14s, fell to unseeded Chen-jui Ho of Taiwan 6-3, 6-3 on Sunday. Aidan lost to fellow No. 9 seed Ross Weibull of Sweden 2-6, 6-1, 6-1 in the boys 12s. Keenan, 6-foot-2 (1.88 meters), is ranked No. 1 in the United States in the 14s. He won the USTA National Clay Court Championships in Fort Lauderdale, Fla., in July. Aidan is ranked No. 3 nationally in the 12s. Both players train at the USTA center in Carson in the Los Angeles region. Brothers Keenan and Aidan Mayo have been on parallel paths in the Junior Orange Bowl. Both Mayos, from the Sacramento suburb of Roseville, lost a set for the first time in this year's tournament but reached the quarterfinals in their respective age groups in Coral Gables, Fla.
Keenan, seeded third in the boys 14s, wore down 17th-seeded Daniel Michalski of Poland 6-4, 6-7 (2), 6-1. Keenan, already 6-foot-2 (1.88 meters), is ranked first in the United States in the 14s. He won the USTA National Clay Court Championships in Fort Lauderdale, Fla., in July. Aidan, seeded ninth in the boys 12s, held off unseeded Juan Zabala Vargas of Ecuador 4-6, 6-1, 6-3. Mayo is ranked third nationally in the 12s. Keenan will face unseeded Chen-jui Ho of Taiwan today, and Aidan will play Sweden's Ross Weibull, also seeded ninth. The Mayos train at the USTA center in Carson in the Los Angeles area. Keenan Mayo had it tougher than his younger brother, Aidan, on Friday. But both residents of Roseville, a suburb of Sacramento, reached the round of 16 in the Junior Orange Bowl in Coral Gables, Fla.
Keenan Mayo, seeded third in the boys 14s, turned back 17th-seeded Jake Hersey of Great Britain 7-6 (6), 7-6 (0). The 6-foot-2 (1.88-meter) Mayo won the USTA National Clay Court Championships in Fort Lauderdale, Fla., in July. He is ranked first in the United States. Aidan Mayo, seeded ninth in the 12s, beat unseeded Faris Khan of San Antonio 6-1, 2-1, retired (back). They are ranked third and fourth, respectively, in the United States. Keenan Mayo will take on 17th-seeded Daniel Michalski of Poland for a quarterfinal berth. Michalski surprised ninth-seeded Joao Silva of Brazil 6-3, 6-4. Aidan Mayo will face unseeded Juan Zabala Vargas of Ecuador. Zabala Vargas dismantled unseeded Tony Huang of China 6-2, 6-1. Brothers Keenan and Aidan Mayo of Roseville in the Sacramento area moved into today's round of 32 in their respective age divisions at the Junior Orange Bowl in Coral Gables, Fla.
Keenan Mayo, seeded third in the boys 14s, defeated Yousef Khamis of Irvine 7-6 (6), 6-4. Aidan Mayo, seeded ninth in the boys 12s, topped Alvaro Guillen-Meza of Ecuador 6-2, 6-4. Also in the boys 12s, Spencer Brachman of Commack, N.Y., ousted top-seeded Shunsuke Mitsui of Japan 6-2, 6-2. Keenan Mayo, ranked No. 1 in his age group in the United States, will play 17th-seeded Jake Hersey of Great Britain. Aidan Mayo will take on Faris Khan of San Antonio. They are ranked third and fourth, respectively, in the country in the 12s. The Mayos train at the USTA center in Carson. Dennis Novikov was born in Moscow and lives in San Jose. But the 21-year-old American also feels at home in Mexico. Novikov ended his year -- finally -- with singles titles in $15,000 Futures tournaments in Merida last week and the previous week. He also reached the doubles final in the first tourney with former UCLA teammate Clay Thompson. Novikov, 6-foot-3 (1.90 meters) with a booming serve, jumped 38 spots to a career-high No. 331 in the world singles rankings with the first Merida crown. Ranked No. 636 at the beginning of the year, he will improve to about No. 292 on Monday with his latest title. Novikov won the singles and doubles titles in the USTA Boys 18 National Championships in Kalamazoo, Mich., in 2012 to earn wild cards for both main draws in the U.S. Open. Amazingly, Novikov reached the second round in each event at Flushing Meadows. He shocked 86th-ranked Jerzy Janowicz, a 6-foot-8 (2.03-meter) Pole and Wimbledon semifinalist last year, in singles and teamed with Michael Redlicki to knock off U.S. veterans Bobby Reynolds and Michael Russell in doubles. Novikov turned pro last year after leading UCLA to the NCAA final as a sophomore. Collin Altamirano, 19-year-old Sacramentan -- No. 744 in singles (-5), No. 873 in doubles (-4). Mackenzie McDonald, 19-year-old Piedmont resident -- No. 637 in singles (-4), No. 588 in doubles (-1). Dennis Novikov, 21-year-old San Jose resident -- Career-high No. 331 in singles (+38), career-high No. 418 in doubles (+47). Matt Seeberger, 30-year-old Los Altos resident -- No. 459 in doubles (-1). Dmitry Tursunov, 32-year-old resident of Folsom in Sacramento area -- No. 110 in singles (no change), No. 178 in doubles (+1). Kristie Ahn, 22-year-old former Stanford star -- No. 639 in singles (+6), No. 706 in doubles (no change). CiCi Bellis, 15-year-old resident of Atherton in San Francisco Bay Area -- No. 256 in singles (+3), career-high No. 822 in doubles (+3). Hadley Berg, 18-year-old resident of Greenbrae in San Francisco Bay Area -- No. 945 in doubles (+2). Alexandra Facey, 21-year-old resident of Cameron Park in Sacramento area -- No. 735 in doubles (-1). Kat Facey, 21-year-old resident of Cameron Park in Sacramento area -- No. 735 in doubles (-1). Nicole Gibbs, 21-year-old former Stanford star -- No. 95 in singles (no change), No. 832 in doubles (+6). Michaela Gordon, 15-year-old resident of Saratoga in San Francisco Bay Area -- Career-high No. 693 in singles (+6). Lejla Hodzic, 28-year-old former Stanford standout -- No. 741 in doubles (no change). Raquel Kops-Jones, 32-year-old San Jose resident and former Cal star -- No. 12 in doubles (no change), No. 798 in singles (+6). Maria Sanchez, 25-year-old Modesto product -- Career-high No. 79 in doubles (no change), No. 240 in singles (no change). Karina Vyrlan, 16-year-old Sacramentan -- No. 965 in singles (+3). Allie Will, 23-year-old native of San Mateo in San Francisco Bay Area -- No. 159 in doubles (+1), No. 541 in singles (-1). Carol Zhao, 19-year-old Stanford sophomore -- No. 295 in singles (+3), No. 512 in doubles (+2). Professional tennis in Northern California suffered another blow last week when Sacramento lost its legends tournament after one year. The capital was omitted from next spring's PowerShares Series schedule of one-night tournaments in 12 North American cities. The Champions Shootout follows the departures of the SAP Open in San Jose and Sacramento Capitals of WorldTeam Tennis. The SAP Open was replaced on the ATP World Tour calendar in February by Rio de Janeiro after 125 years in the San Francisco Bay Area. Also in February, the Capitals announced they were moving to Las Vegas after 28 years in Sacramento. Instead, the franchise folded after owner Deepal Wannakuwatte was charged with defrauding investors in his medical supply business of more than $100 million. He was sentenced last month to 20 years in prison. NorCal still has the Bank of the West Classic at Stanford on the WTA tour; men's Challengers in Aptos, Napa, Sacramento and Tiburon; and women's Challengers in Gold River in the Sacramento area and Redding. James Blake, 34, won the Champions Shootout at Sleep Train Arena in Sacramento in February, defeating 55-year-old International Tennis Hall of Famer John McEnroe 6-3 in the final. Blake was only six months removed from playing on the ATP World Tour. Hall of Famers Pete Sampras and Jim Courier lost in the semifinals of the four-man tournament, which drew an announced crowd of 2,460 at the home of the NBA's Sacramento Kings. The 2015 PowerShares Series will begin March 24 in Salt Lake City and end May 2 in Vancouver, British Columbia. Set to compete are five Hall of Famers -- Sampras, McEnroe, Courier, Andre Agassi and Michael Chang -- likely future Hall of Famer Andy Roddick and former top-10 players Blake and Mark Philippoussis. Brothers Keenan and Aidan Mayo of Roseville in the Sacramento area won their opening matches today at the Junior Orange Bowl in Coral Gables, Fla.
Keenan Mayo, seeded third, received a first-round bye and overwhelmed Christopher Herrera of Guatemala 6-0, 6-1 to reach the round of 64 in the boys 14s. The 6-foot-2 (1.88-meter) Mayo, ranked No. 1 in his age group in the United States, won the USTA National Clay Court Championships in Fort Lauderdale, Fla., in July. Aidan Mayo, one of eight players seeded ninth, outclassed Mathias Musil of the Czech Republic 6-3, 6-3 in the first round of the boys 12s. Mayo is ranked third in the United States. Despite falling short of the Orange Bowl girls 18 singles title, CiCi Bellis had a great week. The 15-year-old sensation from Atherton in the San Francisco Bay Area clinched the year-end No. 1 junior ranking on Friday and picked up the doubles title today at the prestigious clay-court tournament in Plantation, Fla.
Bellis rose from No. 2 to No. 1 by reaching the quarterfinals after previously top-ranked Shilin Xu of China lost in the first round. The second-seeded Bellis then fell to 13th seed and eventual champion Sofia Kenin, 16, of Pembroke Pines, Fla., in the semifinals. In the doubles final, Bellis and Marketa Vondrousova of the Czech Republic edged seventh-seeded Miriam Kolodziejova of the Czech Republic and Tereza Mihalikova of Slovakia 7-5, 2-6 [10-4]. Bellis and Vondrousova reached the French Open girls final in June, a prelude to Bellis' stunning victory over 12th-seeded Dominika Cibulkova in the first round of the U.S. Open in August. Cibulkova had marched to her first Grand Slam final in January, losing to now-retired Li Na in the Australian Open. Another 16-year-old from Pembroke Pines in the Miami area won the boys 18 singles title. Second-seeded Stefan Kozlov topped unseeded Stefanos Tsitsipas of Greece 2-6, 6-3, 6-2 for his first Orange Bowl crown in four singles finals. He had lost in the boys 12, 14 and 18 title matches. Americans swept the boys and girls 18 singles crowns for the first time since Timothy Neilly and Jessica Kirkland in 2004 and won in six of the eight Orange Bowl finals. Kozlov also won the doubles crown with Michael Mmoh of Temple Hills, Md. They were seeded first. Showing remarkable skill and maturity in the $100,000 Sacramento Challenger in October, Kozlov advanced to the final before losing to U.S. Davis Cup veteran Sam Querrey. The Orange Bowl is the most prestigious non-Grand Slam junior tournament in the world. Past Orange Bowl champions on clay include Chris Evert (1969-70), Bjorn Borg (1972), John McEnroe (1976), Ivan Lendl (1977), Gabriela Sabatini (1984), Mary Joe Fernandez (1985), Jim Courier (1987) and Anna Kournikova (1995). Former winners on hard courts include Roger Federer (1998), Elena Dementieva (1998), Andy Roddick (1999), Vera Zvonareva (2000-01), Marcos Baghdatis (2003), Nicole Vaidisova (2003) and Caroline Wozniacki (2005). The Junior Orange Bowl, for boys and girls 14s and 12s, is scheduled for Wednesday through Dec. 23 at various sites in the Miami area. Boys 18 singles -- Stefan Kozlov (2), Pembroke Pines, Fla., def. Stefanos Tsitsipas, Greece, 2-6, 6-3, 6-2. Boys 18 doubles -- Stefan Kozlov, Pembroke Pines, Fla., and Michael Mmoh (1), Temple Hills, Md., def. Yunseong Chun and Seong Chan Hong (2), South Korea, 6-4, 7-6 (5). Boys 16 singles -- Sam Riffice (2), Roseville, def. Mattias Siimar (10), Estonia, 6-1, 1-6, 7-5. Boys 16 doubles -- Basil Khuma, India, and Christian Lakoseljac, Canada, def. Kristofer Siimar and Mattias Siimar (8), Estonia, 6-3, 6-4. Girls 18 singles -- Sofia Kenin (13), Pembroke Pines, Fla., def. Ingrid Neel, Rochester, Min., 6-3, 6-3. Girls 18 doubles -- CiCi Bellis, Atherton, and Marketa Vondrousova (1), Czech Republic, def. Miriam Kolodziejova, Czech Republic, and Tereza Mihalikova (7), Slovakia, 7-5, 2-6 [10-4]. Girls 16 singles -- Bianca Andreescu (8), Canada, def. Dominique Schaefer (11), Peru, 7-5, 6-3. Girls 16 doubles -- Emma Decoste, Stuart, Fla., and Kariann Pierre-Louis, Miami, def. Sofia Munera Sanchez, Colombia, and Camila Vargas Gomez (1), Peru, 6-1, 7-5. Today was bittersweet for Northern California in the Orange Bowl. Sam Riffice of Roseville in the Sacramento region completed a rare double in the boys 16s, but CiCi Bellis of Atherton in the San Francisco Bay Area was upset in the girls 18s. Both players are 15. Riffice, seeded second, rallied to beat 10th-seeded Mattias Siimar of Estonia 6-1, 1-6, 7-5 to win the clay-court tournament in Plantation, Fla. Riffice, who trains at the USTA center in Boca Raton, Fla., won the last three games. Riffice also won last week's Eddie Herr International Championships on hardcourts in Bradenton, Fla. He joins Grigor Dimitrov, the 11th-ranked man in the world after reaching a career-high No. 8 in August, as the only players to sweep the boys 16 titles in the prestigious tournaments. Bellis, also seeded second, lost to 13th-seeded Sofia Kenin of Pembroke Pines, Fla., 6-3, 6-2 in the semifinals. Bellis became a national sensation in August by stunning Dominika Cibulkova, the Australian Open runner-up in January, in the first round of women's singles in the U.S. Open. Kenin, who turned 16 last month, captured the Eddie Herr doubles title with Jessica Ho of Wexford, Pa., last week. Kenin also qualified for the $75,000 Albuquerque Challenger in September in singles, beating veteran pro Maria Sanchez from Modesto, before falling in the first round to 34-year-old Petra Rampre. Kenin will meet qualifier Ingrid Neel of Rochester, Minn., for the title. Neel outlasted unseeded Monika Kilnarova of the Czech Republic 6-2, 4-6, 6-4. Second-seeded Stefan Kozlov, 16, of Pembroke Pines reached the boys 18 final for the second consecutive year, beating unseeded Reilly Opelka of Palm Coast, Fla., 6-2, 3-6, 6-1. Opelka, 6-foot-10 (2.08 meters), won the Eddie Herr title last week. Kozlov did not play. Kozlov, who turned pro two years ago, broke through on the men's tour by reaching the final of the $100,000 Sacramento Challenger in October. He will face unseeded Stefanos Tsitsipas of Greece today for the title. Tsitsipas stunned Russia's Andrey Rublev, the top-ranked junior in the world, 6-4, 7-5. Kozlov lost to fellow American Francis Tiafoe in last year's final. Although Tiafoe is only 16, he did not return this year. Bellis salvaged her day by advancing to the girls 18 doubles final with Marketa Vondrousova of the Czech Republic. The top seeds, who reached the French Open girls doubles final in June, stopped third-seeded Usue Arconada of Puerto Rico and Fanni Stollar of Hungary 6-3, 6-4. Bellis and Vondrousova will play seventh-seeded Miriam Kolodziejova of the Czech Republic and Tereza Mihalikova of Slovakia. CiCi Bellis and Michaela Gordon, 15-year-old residents of the San Francisco Bay Area, both faced qualifiers in the third round of the girls 18s at the Orange Bowl on Thursday. Atherton's Bellis, seeded second, defeated Maria Shishkina, a native of Kazakhstan living in Bradenton, Fla., 7-6 (7), 6-1 on clay in Plantation, Fla. The unseeded Gordon, from Saratoga, lost to Kayla Day of Santa Barbara 3-6, 6-1, 7-5. Bellis, the second-ranked junior in the world, is scheduled to face unseeded Caroline Dolehide, 16, of Hinsdale, Ill., for the first time in today's quarterfinals. Dolehide breezed past Dasha Ivanova of Beaverton, Ore., 6-1, 6-1. Meanwhile, second-seeded Stefan Kozlov, a 16-year-old sensation from Pembroke Pines, Fla., coasted into the boys 18 quarters. Second-seeded Sam Riffice of Roseville in the Sacramento area advanced to the boys 16 semifinals, extending his winning streak to 10 matches with a 6-1, 6-0 victory over unseeded Victor Krustev of Canada. The 15-year-old Riffice, who trains at the USTA center in Boca Raton, Fla., won last week's Eddie Herr International Championships on hardcourts in Bradenton. Riffice will meet 12th-seeded Nathan Perrone of Mount Laurel, N.J. Riffice leads the head-to-head series 2-0, with both matches coming this year on hardcourts. In girls 18 doubles, top-seeded Bellis and Marketa Vondrousova of the Czech Republic eked out a 3-6, 6-3 [10-8] victory over Raquel Pedraza of Claremont in the Los Angeles area and Charlotte Robillard-Millette of Canada to reach the quarterfinals. Brothers Dominic and Paul Barretto of Bel Tiburon in the Bay Area lost a heartbreaker to Basil Khuma of India and Christian Lakoseljac of Canada, 4-6, 6-0 [10-8] in the boys 16 semifinals. Having grown up in South Dakota and the San Francisco Bay Area, Michaela Gordon is not accustomed to playing on clay. But the 15-year-old resident of Saratoga surprised fourth-seeded Anna Kalinskaya of Russia 6-3, 6-2 today in the second round of the girls 18s at the Orange Bowl in Plantation, Fla. The 16-year-old Kalinskaya is the 13th-ranked junior in the world, and is Gordon 56th. Gordon is scheduled to face qualifier Kayla Day, a 15-year-old left-hander from Santa Barbara, today at 8 a.m. PST for a berth in the quarterfinals. Also advancing in the girls 18s was second-seeded CiCi Bellis, 15, of Atherton in the Bay Area. Bellis, ranked second in the world, defeated Miriam Kolodziejova of the Czech Republic 6-1, 7-6 (3). Bellis, who actually has extensive experience on clay, will play qualifier Maria Shishkina of Bradenton, Fla., not before 8:30 a.m. PST. Shishkina, a 16-year-old native of Kazakhstan, was profiled at 11 in ESPN The Magazine: http://sports.espn.go.com/sports/tennis/news/story?id=5289995. In the boys 18s, second-seeded Stefan Kozlov of Pembroke Pines, Fla., beat Chien Hsun Lo of Taiwan 6-0, 6-4. Kozlov, who turned pro two years ago at 14, broke through on the men's circuit by reaching the final of the $100,000 Sacramento Challenger in October. Second-seeded Sam Riffice of Roseville in the Sacramento area advanced to the boys 16 quarters in the Orange Bowl with a 6-1, 6-3 victory over qualifier Brian Cernoch of North Bethesda, Md. Riffice, 15, trains at the USTA center in Boca Raton, Fla.
Norway's Casper Ruud, the top seed in the boys 16s, lost to 14th-seeded Vasil Kirkov of Tampa, Fla., 6-4, 6-3. Kirkov and Riffice, the No. 2 seeds in doubles who won the boys 16 title in the Eddie Herr International Championships last week, fell to unseeded Basil Khuma of India and Christian Lakoseljac of Canada 6-4, 3-6 [10-7] in the quarterfinals. But brothers Dominic and Paul Barretto of Bel Tiburon in the Bay Area edged Canadians Sean Huynh and Elijah Ogilvie 4-6, 6-3 [12-10]. In girls 18 doubles, top-seeded Bellis and Marketa Vondrousova of the Czech Republic routed Gordon and Emma Higuchi of Los Angeles 6-1, 6-1 in the first round. Bellis and Vondrousova reached the French Open girls doubles final in June. Second-seeded Sam Riffice of Roseville in the Sacramento area defeated Alexandre Rotsaert of Boca Raton, Fla., 7-5, 6-3 today in the second round of the boys 16s at the Orange Bowl on clay in Plantation, Fla.
Riffice, who won last week's Eddie Herr International Championships on hard courts in Bradenton, Fla., is scheduled to play qualifier Brian Cernoch of North Bethesda, Md., on Wednesday for a berth in the quarterfinals. Cernoch dominated Kristofer Siimar of Estonia 6-2, 6-0. In boys 16 doubles, second-seeded Riffice and Vasil Kirkov of Tampa, Fla., the Eddie Herr champions, downed Alexis Galarneau of Canada and Patrick Kypson of Greenville, N.C., 6-4, 6-2 to reach the quarters. Brothers Paul and Dominic Barretto of Bel Tiburon in the San Francisco Bay Area also advanced to the quarters, beating Maxwell Mendelsohn of Little Rock, Ark., and Jake Van Emburgh of Verona, Wis., 6-3, 6-3. Bay Area residents CiCi Bellis, seeded second, and Michaela Gordon, unseeded, are scheduled to play their second-round singles matches in the girls 18s on Wednesday. Bellis, from Atherton, and Gordon, from Saratoga, are both 15. The Junior Orange Bowl, for boys and girls 14s and 12s, is scheduled for Dec. 17-23 at various sites in the Miami area. CiCi Bellis and Sam Riffice, Northern California 15-year-olds who are seeded second in their age groups, won their Orange Bowl openers on clay in Plantation, Fla., today in unusual fashion. Bellis, from Atherton in the San Francisco Bay Area, demolished wild card Alisa Rudenko of Russia 6-0, 6-0 in the girls 18s. Riffice, a product of Roseville in the Sacramento region who trains at the USTA center in Boca Raton, Fla., rallied past Jesus Suarez Rivas of Mexico 0-6, 6-1, 6-0 in the boys 16s. Riffice played one day after winning the title in the Eddie Herr International Championships on hard courts in Bradenton, Fla. The Orange Bowl is the most prestigious non-Grand Slam junior tournament in the world. The Junior Orange Bowl, for boys and girls 14s and 12s, is scheduled for Dec. 17-23 at various sites in the Miami area. Also advancing in the girls 18s at the Orange Bowl was Michaela Gordon of Saratoga in the Bay Area. Gordon, another 15-year-old, topped Destanee Aiava of Australia 6-1, 7-5 to set up a match against fourth-seeded Anna Kalinskaya of Russia. Upset in the girls 18s were top-seeded Shilin Xu, the No. 1 junior in the world, of China and third-seeded Marketa Vondrousova of the Czech Republic. The 16-year-old Xu, who prefers hard courts, lost to 86th-ranked Katherine Sebov, a 15-year-old Canadian, 6-4, 6-2. Sebov defeated Bellis in the first round last year. Vondrousova fell to Katie Swan of Great Britain 6-4, 2-6, 6-1. With Xu's loss, world No. 2 Bellis could regain the top spot to end the year. Bellis made international headlines in August by stunning Australian Open runner-up Dominika Cibulkova in the first round of women's singles at the U.S. Open. Second-seeded Stefan Kozlov, playing near his home in Pembroke Pines, Fla., defeated Chien Hsun Lo of Taiwan 6-1, 6-4 in a boys 18 opener. Kozlov, 16, turned pro two years ago. He broke through at the $100,000 Sacramento Challenger in October, reaching the final as a wild card before losing to U.S. Davis Cup veteran Sam Querrey. Kozlov, the 464th-ranked man in the world, is the youngest player in the top 500. Lucky loser Paul Barretto of Bel Tiburon in the Bay Area lost to Chase Wood of Heath, Texas, 7-5, 6-4 in the boys 16s. However, Barretto and his brother Dominic knocked off seventh-seeded Jorge Ortegon of Mexico and Suarez Rivas 6-2, 6-4 in the first round of doubles. Second-seeded Vasil Kirkov of Tampa, Fla., and Riffice, coming off the boys 16 doubles title in the Eddie Herr, overwhelmed Canadians Jack Davis and Kiran Phaterpekar 6-0, 6-1 in the same age division. Roger Federer must have some flaws -- if not on the court, then off. Maybe he doesn't floss daily. Maybe he occasionally forgets to take out the garbage. Maybe he jaywalked once. If so, you won't read about it in "Facing Federer: Symposium of a Champion," a 131-page collection of quotes about the Swiss maestro by Scoop Malinowski. Federer, who recently won his first Davis Cup title, appears to come as close to perfection not only as a tennis player but as a person as one can get. Federer, of course, is the complete package as a player, with a record 17 Grand Slam singles titles to show for it. He's lightning fast and exceptionally smart. He has incredible anticipation, focus, determination and poise. And he can effortlessly hit every shot in the book. Amazingly, Federer is equally impressive off the court. He's eternally cheerful. Far from being arrogant, he greets all acquaintances, even obscure players he hasn't seen in years, by name and treats everyone, including cafeteria workers, with respect. Also, Federer patiently conducts endless interviews in fluent Swiss German (his native language), German, French and English. Despite the overwhelming demands on his time, the husband and now father of four spent countless hours in meetings as the president of the ATP Player Council from 2008 until this year. "Facing Federer" is repetitive but contains many nuggets, and fans will get to know him much better by reading it. Here are two excerpts. John McEnroe: "Federer plays tennis the way I dreamed of playing. He could be the most talented player I've ever seen, someone who comes along only every 10 or 20 years. If you want to be a tennis player, then mold yourself on Roger Federer. I won three Wimbledon titles, and I wish I could play like him." Rene Stauffer (Federer biographer): "This is a guy who buys drinks for photographers and thanks reporters who show up to his press conferences. Roger lives that saying: "It's nice to be important, but it's important to be nice." The only hints of criticism about Federer in the book are that he self-admittedly was a hothead as a junior and that his backhand might not be as strong as the rest of his game. Perhaps former WTA player Akiko Morigami of Japan put it best about Federer in the second quote of the book: "I think he's like the God of tennis." Steve Mohibi. Photo courtesy of Amine Khaldi. Top-seeded Sam Riffice of Roseville in the Sacramento area beat unseeded Patrick Kypson of Greenville, N.C., 7-6 (3), 6-1 today to win the boys 16 title at the Eddie Herr International Championships in Bradenton, Fla.
"He came out really hot and went up 3-0 and 5-2," Riffice, who trains at the USTA center in Boca Raton, Fla., said of his fellow 15-year-old on tenniskalamazoo.blogspot.com. "It was a really good first set; we had really good points. "In the second set, I think he might have hurt his ab a little bit, so it wasn't as physical, but it was a really good match, I thought." Riffice and Vasil Kirkov of Tampa, Fla., won the boys 16 doubles title on Saturday. The Eddie Herr is one of the top junior tournaments in the world. Past competitors include Roger Federer, Andy Roddick, David Nalbandian, Maria Sharapova, Jelena Jankovic and Ana Ivanovic. Herr, the father of international junior tennis, died in 2000 at 93. Boys 18 -- Reilly Opelka (6-foot-10, 2.08 meters), Palm Coast, Fla. Boys 16 -- Sam Riffice, Roseville. Boys 14 -- Nicolas Mejia, Colombia. Boys 12 -- Jungwon Park, South Korea. Girls 18 -- Dalma Galfi, Hungary. Girls 16 -- Sofia Sewing, Doral, Fla. Girls 14 -- Anastasia Potapova, Russia. Girls 12 -- Himari Sato, Japan. National 40 Hard Court Championships today in La Jolla. 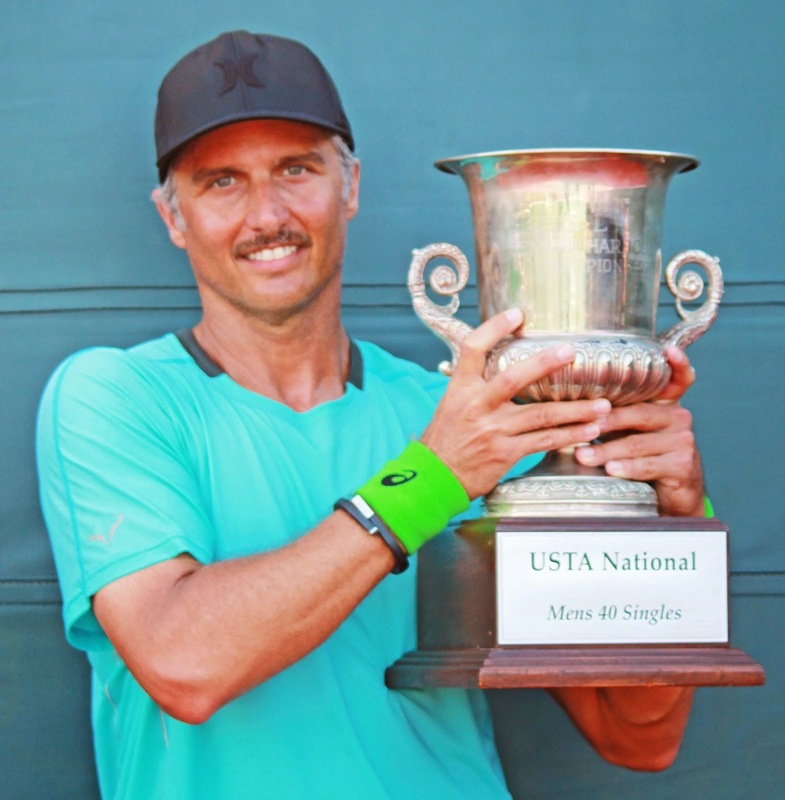 Second-seeded Tony Bujan of Tustin retained his title in the USTA National 40 Hard Court Championships, defeating top-seeded Oren Motevassel of San Jose 6-2, 6-4 today in the San Diego suburb of La Jolla. "It just feels great to play well," Bujan, a 44-year-old teaching professional based in Orange County, said in a news release. "I love playing, and I love competing. Tennis has done so much for me. "(Motevassel) doesn’t overpower you, but he doesn’t miss. He’s crafty with his backhand. I just tried to stay aggressive and dictate and keep him off-balance." Motevassel, 47, won the title in 2011 and 2012. Third-seeded Dina McBride of Stevenson Ranch won the women's title, beating top-seeded Jennifer Dawson of Carlsbad 6-4, 6-2. McBride, a 43-year-old teaching pro in Valencia, overcame an undisclosed injury early in the tournament. "I won it on just faith and believing," she said. "Coming in, I felt great, but I got injured in the first round and didn’t think I was going to be able to pull through. I just took it one match at a time. "Every year, you never know how you’re going to feel. I had to seize the moment because these opportunities don’t come around too often. I love tennis. I love the game, and I love competing. It’s just fun." McBride lost the 2011 singles final to Dawson when she retired because of a leg injury in the first set. McBride captured the 2012 title by beating former world No. 15 Ros (Fairbank) Nideffer. Top-seeded Sam Riffice of Roseville in the Sacramento area advanced to today's boys 16 final at the Eddie Herr International Championships in Bradenton, Fla., when third-seeded William Tutecky of Canada withdrew because of illness on Saturday. Riffice, who trains at the USTA center in Boca Raton, Fla., will face unseeded Patrick Kypson of Greenville, N.C. Kypson defeated No. 6 seed Vasil Kirkov of Tampa, Fla., 6-2, 6-4. Meanwhile, Riffice and his Roseville neighbor, Keenan Mayo, earned doubles titles on Saturday. Mayo trains at the USTA center in Carson. The top-seeded Kirkov and Riffice edged seventh-seeded Vale Duarte of Portugal and Kypson 6-1, 1-6 [10-8]. Second-seeded Roscoe Bellamy of Pacific Palisades in the Los Angeles area and Mayo beat unseeded Andrew Fenty of College Park, Md., and Brian Shi of Jericho, N.Y., 7-6 (6), 6-2 in the boys 14s. Fenty's father, Adrian, served as the mayor of Washington, D.C., from 2007 to 2011. Oren Motevassel will get another crack at Tony Bujan, this time for a title. 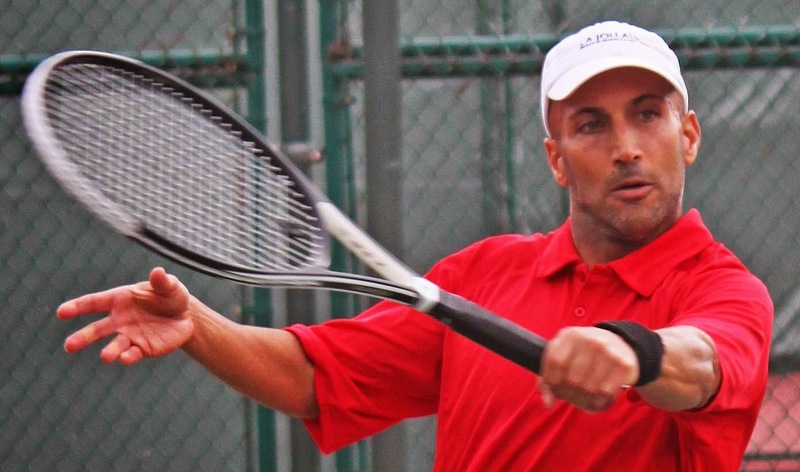 The top-seeded Motevassel, 47, of San Jose, will meet the second-seeded Bujan, 44, of Tustin in the Los Angeles area, today in the final of the USTA National 40 Hard Court Championships in the San Diego suburb of La Jolla. Motevassel eliminated sixth-seeded Jeff Greenwald of San Anselmo in the San Francisco Bay Area 6-4, 6-1 on Saturday, and Bujan outplayed fifth-seeded Michael Chang -- no, not that Michael Chang -- of Anaheim 6-3, 6-1. Bujan defeated Motevassel 6-3, 7-5 in last year's semifinals and went on to win the title. Motevassel was the two-time defending champion. In today's women's final, top-seeded Jennifer Dawson, 42, of Carlsbad will meet third-seeded Dina McBride, 47, of Stevenson Ranch. Dawson clobbered unseeded Christy Panter of West Hills 6-1, 6-0, and McBride held off third-seeded Ros (Fairbank) Nideffer of San Diego 6-3, 7-5. Nideffer, a 54-year-old former touring professional originally from South Africa, reached career No. 15 in the world in singles in 1990 and No. 12 in doubles in 1986. Nideffer won the French Open women's doubles title in 1981 with Tanya Harford of South Africa and in 1983 with Candy Reynolds of the United States. Dawson routed McBride 6-2, 6-0 for third place last year. Jeff Tarango of Manhattan Beach 6-4, 6-1 in the quarterfinals. 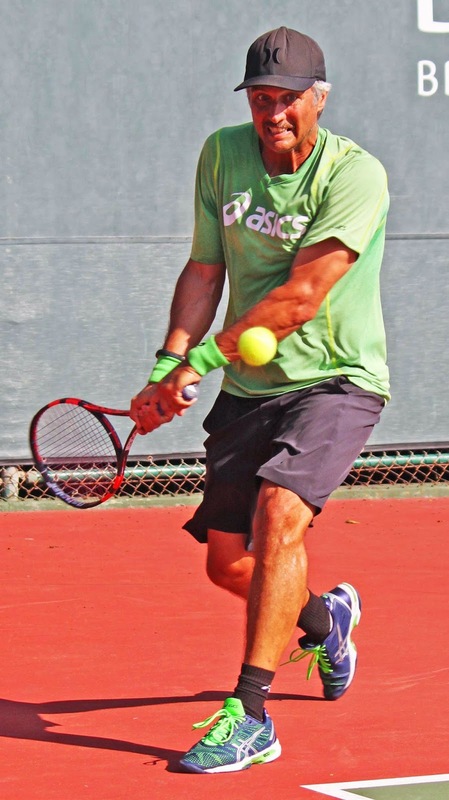 In a matchup of former tournament champions, sixth-seeded Jeff Greenwald of San Anselmo beat third-seeded Jeff Tarango of Manhattan Beach 6-4, 6-1 on Friday in the quarterfinals of the USTA National 40 Hard Court Championships in the San Diego suburb of La Jolla. Greenwald won the title in 2009 and Tarango, a former Stanford All-American, triumphed the following year. Tarango climbed to No. 42 in the world in singles in 1992 and No. 10 in doubles in 1999. In today's semifinals, Greenwald will play top-seeded Oren Motevassel of San Jose, and second-seeded Tony Bujan of Tustin will meet fifth-seeded Michael Chang -- no, not that Michael Chang -- of Anaheim. Motevassel, a native of Israel who reached No. 161 in the world in 1997, won the National 40 Hard Court title in 2011 and 2012. Bujan is the defending champion. Oren Motevassel (1), San Jose, def. Nicolas Chasseray (9), San Francisco, 6-3, 6-0. Tony Bujan (2), Tustin, def. John Saviano (9), Los Altos Hills, 6-1, 6-1. Jeff Greenwald (6), San Anselmo, def. Jeff Tarango (3), Manhattan Beach, 6-4, 6-1. Michael Chang (5), Anaheim, def. Pierre Mareschal (9), Pasadena, 2-6, 6-0 [10-6]. Jennifer Dawson (1), Carlsbad, def. 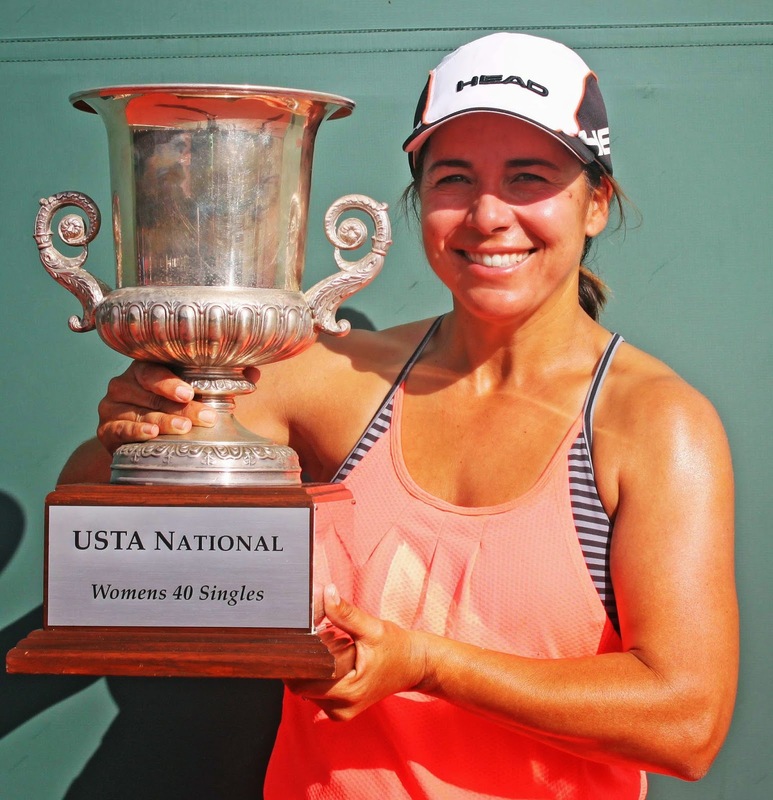 Maria Nunez, San Diego, 6-0, 6-0. Ros Nideffer (2), San Diego, def. Julie Gaynor, Las Vegas, 6-3, 6-4. Dina McBride (3), Stevenson Ranch, def. Fanny Gamble, San Rafael, 7-5, 6-1. Christy Panter, West Hills, def. Marlo Carruth (4), Studio City, 7-6 (5), 3-6 [10-6]. Fifth-seeded Elena Gabriela Ruse of Romania edged top-seeded CiCi Bellis of Atherton in the San Francisco Bay Area 4-6, 6-4, 7-6 (4) today in the girls 18 quarterfinals at the Eddie Herr International Championships in Bradenton, Fla. The 15-year-old Bellis, two years younger than Ruse, led 3-0 in the third set and served for the match at 6-5. Bellis became a national sensation in August by stunning 12th-seeded Dominika Cibulkova, the Australian Open runner-up in January, in the first round of women's singles at the U.S. Open in August. Bellis then lost to Zarina Diyas of Kazakhstan. 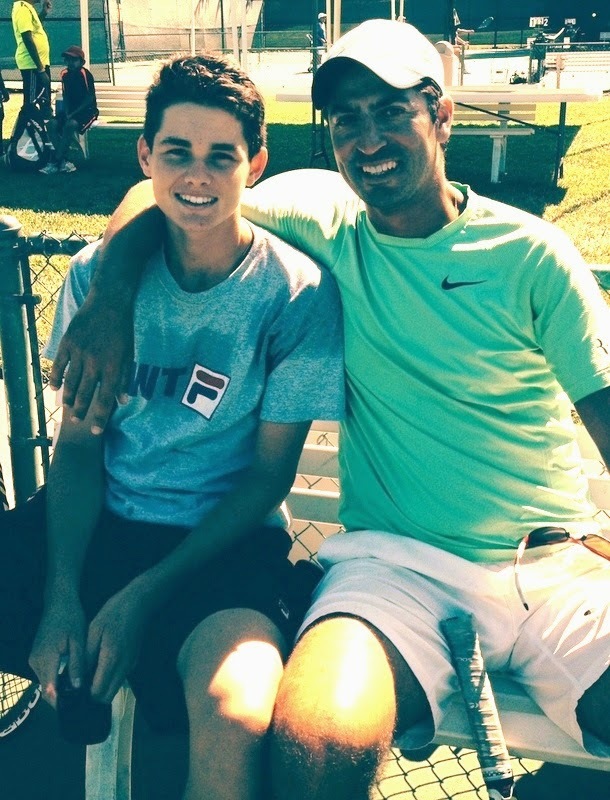 In the boys 16s of the Eddie Herr, top-seeded Sam Riffice of Roseville in the Sacramento area demolished eighth-seeded Jesus Suarez Rivas 6-1, 6-0 in the quarterfinals. Riffice, who trains at the USTA center in Boca Raton, Fla., will face third-seeded William Tutecky of Canada on Saturday for a berth in the final. Riffice and Keenan Mayo, who grew up a few houses apart in Roseville, reached the doubles final in their respective divisions. Top-seeded Vasil Kirkov of Tampa, Fla., and Riffice topped fifth-seeded Andres Andrade and Jason Legall 7-5, 6-3 in an all-American encounter. Kirkov and Riffice will meet seventh-seeded Vale Duarte of Portugal and Patrick Kypson of Greenville, N.C.
Second-seeded Roscoe Bellamy of Pacific Palisades in the Los Angeles region and Mayo routed unseeded Tomasz Dudek and Karol Paluch of Poland 6-2, 6-1 in the boys 14s. Bellamy and Mayo will play unseeded Andrew Fenty of College Park, Md., and Brian Shi of Jericho, N.Y.
Nick Saviano, a two-time Stanford All-American in the 1970s, announced last week that he and Eugenie Bouchard have agreed to end their coach-player relationship after eight years. Bouchard was named the WTA's Newcomer of the Year in 2013 and Most Improved Player this year. Ranked No. 32 at the beginning of 2014, she reached her first Grand Slam final at Wimbledon and the semifinals of the Australian Open and French Open. She also won her first WTA title at Nurnberg in May. “This past year, traveling with Genie to all of the majors has been a wonderful experience with memories I will cherish for a lifetime," Saviano said. "I have no doubt that Genie will accomplish great things. I wish her all the best." The 20-year-old Canadian's season, however, ended on a disappointing note. She lost all three of her matches in the WTA Finals in Singapore, never winning more than three games in a set. Saviano, who has coached numerous top tour players, will continue to work with professionals and world-class juniors at his Saviano High Performance Tennis program in Plantation, Fla.
Top-seeded CiCi Bellis of Atherton in the San Francisco Bay Area defeated wild card Ingrid Neel of Rochester, Minn., 6-2, 7-5 on Thursday to reach the quarterfinals of the Eddie Herr International Championships in Bradenton, Fla.
Bellis, 15, will meet fifth-seeded Elena Gabriela Ruse, 17, of Romania today. Ruse beat 10th-seeded Anna Blinkova of Russia 6-4, 6-4. Meanwhile, Sam Riffice (boys 16s) and Keenan Mayo (boys 14s) of Roseville in the Sacramento region advanced to the doubles semifinals. Riffice is seeded first with Vasil Kirkov of Tampa, Fla., and Mayo is seeded second with Roscoe Bellamy of Pacific Palisades in the Los Angeles area. Riffice, also seeded first in singles, is scheduled play eight-seeded Jesus Suarez Rivas of Mexico today in quarterfinals. The Eddie Herr is one of the top junior tournaments in the world. Past competitors include Roger Federer, Andy Roddick, David Nalbandian, Maria Sharapova, Jelena Jankovic and Ana Ivanovic. Herr, the father of international junior tennis, died in 2000 at 93.
on Thurday. Photo courtesy of FJS Communications. Top-seeded Oren Motevassel and three other Northern California men reached the quarterfinals of the USTA National 40 Hard Court Championships in the San Diego suburb of La Jolla. Motevassel, the 2011 and 2012 champion from San Jose, lost only two games in two matches as the sun came out on Thursday after two days of rain. Also advancing were No. 6 seed Jeff Greenwald of San Anselmo, and No. 9 seeds Nicolas Chasseray of San Francisco and John Saviano of Los Altos Hills. Motevassel will play Chasseray, Greenwald will face third-seeded Jeff Tarango of Manhattan Beach, and Saviano will take on second-seeded Tony Bujan of Tustin. Tarango won the title in 2010, and Bujan is the defending champion. Tarango, a former Stanford All-American, climbed to career highs of No. 10 in the world in doubles in 1999 and No. 42 in singles in 1992. The only NorCal woman to reach the quarters is Fanny Gamble of San Rafael. She will meet third-seeded Dina McBride of Stevenson Ranch. Oren Motevassel (1), San Jose, def. Misha Yevtich, Las Vegas, 6-0, 6-1. David Smith, San Francisco, def. Michael Sanchez, New York, 2-1, ret. Nicolas Chasseray (9), San Francisco, def. Sergio Rico, La Jolla, 6-3, 0-6 [10-7]. Jeff Greenwald (6), San Anselmo, def. Esteban Altuna, Norco, 6-1, 6-1. John Saviano (9), Los Altos Hills, def. Jorg Muller, New Port Richey, Fla., 7-6 (6), 5-0, ret. Joshua Prager (9), Yuba City, def. James Conda, San Diego, 6-0, 6-3. Oren Motevassel (1), San Jose, def. Leon Bax (9), Mountain View, 6-0, 6-1. Nicolas Chasseray (9), San Francisco, def. David Smith, San Francisco, 6-3, 6-4. Jeff Greenwald (6), San Anselmo, def. Christopher Criblez (9), Laguna Hills, 6-3, 6-2. John Saviano (9), Los Altos Hills, def. Jon Hoffpauir, Escondido, 6-4, 6-2. Tony Bujan (2), Tustin, def. Joshua Prager (9), Yuba City, 6-4, 6-2. Marlo Carruth (4), Studio City, def. Leora Grimshaw, Novato, 6-1, 6-2. Fanny Gamble, San Rafael, def. Mary Ann Beckendorf, Bryan, Texas, 6-1, 6-1. The number of Northern California juniors remaining in singles at the Eddie Herr International Junior Championships in Bradenton, Fla., was whittled in half today. In the girls 18s, top-seeded CiCi Bellis of Atherton reached the round of 16, but unseeded Michaela Gordon of Saratoga surprisingly lost. Both San Francisco Bay Area residents are 15. Bellis, who stunned Australian Open runner-up Dominika Cibulkova in the first round of women's singles at the U.S. Open in August, beat unseeded Destanee Aiava of Australia 7-6 (7), 6-0. Gordon fell to unseeded Maia Lumsden of Great Britain 1-6, 6-4, 6-3 after drubbing her 6-2, 6-1 in the girls round of 16 at Wimbledon in July. Playing on the boys' side today were Sam Riffice and Keenan Mayo, who grew up a few houses apart in the Sacramento suburb of Roseville before moving to the USTA training centers in Boca Raton, Fla., and Carson, Calif., respectively. Riffice, the top seed in the boys 16s, outlasted 10th-seeded Trent Bryde of Suwanee, Ga., 1-6, 6-3, 6-3 to reach the quarterfinals. But Mayo, seeded ninth in the boys 14s, lost to his doubles partner, eighth-seeded Roscoe Bellamy of Pacific Palisades in the Los Angeles area, 6-2, 6-1 in the round of 16. Both Riffice and Mayo advanced to the doubles quarterfinals with straight-set victories. Riffice is seeded first with Vasil Kirkov of Tampa, Fla., and Bellamy and Mayo are seeded second. Rain continued to wreak havoc with the schedule at the USTA National 40 Hard Court Championships in the San Diego suburb of La Jolla. All of today's matches were postponed, and only one was completed on Tuesday. Thursday's forecast is partly cloudy with a 20 percent chance of rain, and matches are scheduled to begin at 8 a.m. PST. There is little or no chance of rain from Friday through Sunday. Tournament referee Ralph Anderson said men's third- and fourth-round matches will be contested on Thursday, while the women will play in the second round. All of Thursday’s matches will use a match tiebreak in lieu of a third set. "Despite the rain and postponements, we are going to make every effort possible to get the tournament back on schedule so we can complete the event this weekend,” Anderson said in a news release. A special tribute to International Tennis Hall of Famer Dorothy "Dodo" Bundy Cheney, who died on Nov. 23 at 98, will take place during a reception for tournament players on Friday evening at the La Jolla Beach & Tennis Club. Cheney, who played into her 90s, amassed over 390 USTA national titles, winning many of them at the LJB&TC. In the National 40 Hard Courts, she captured the women's singles title 13 straight times (1957-69), the women's doubles crown nine times with six partners and the mixed doubles championship five times.